AC Engineering’s disposable pumps are used in a variety of industries including the food, dairy, medical, chemical and pharmaceutical industries. AC’s proprietary positive displacement pumps have a motor drive and a separate replaceable pump head. The pump head is easily and quickly changed when worn or contaminated, providing for a completely new pump. As a result, AC pumps boast a long service-free life. The disposable pump head is completely sealed, and is an improved alternative to peristaltic and magnetically driven pumps. The AC pump design, while simple in construction and economical, is capable of 500 liters/minute flow, and pressures of up to 50 psi. The single vane scroll pump is without valves, and their associated noise and pressure spikes. AC’s scroll components are pressure balanced, so there are no high rubbing forces between parts, as in other pumps, and while no lubrication is necessary wear is minimal. The pumped media is subjected to minimal shear. 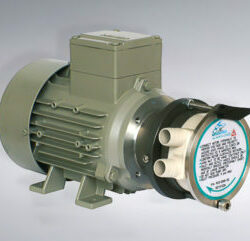 AC’s scroll pumps are molded in FDA food approved resin, which is resistant to a wide range of chemicals. AC’s low cost pump head is replaced conveniently without tools, eliminating cleaning and disinfection. Unlike other scrolls, AC’s pump has a single cylindrical chamber, facilitating the pumping of non-compressible fluids. AC’s pump does not have pockets which trap fluid or shear it as do magnetically driven pumps. All pump bearings are external to the pump head so they do not contaminate the pumped media, which in turn does not affect bearing lubrication.